For many years now, the final race of the season has been the Woodford Long Distance race. Although not as many entries as the previous day, it was nevertheless great to have eight boats rigged and ready to go. 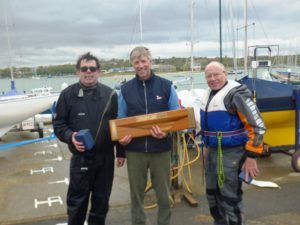 Because it is so weather dependent the course is always decided on the day and with a brisk NE’erly forecast, the decision to remain in the harbour was an easy one for the race officers to make. With no Bembridge One-Designers wanting to get cold and wet, the Illusion flags were quickly transferred to Sea Breeze and having agreed that there would be three races, the course was set up with an initial windward mark off Bembridge Point, the BHYC turning mark (H) as a wing and a leeward mark in front of the Houseboats. Although not one of the closer starts of the season, most headed towards the St Helens shore to get out of the tide. Bruce Huber was first round the windward mark and never looked like being overtaken. There was little separating Bill Daniels, Robin Ebsworth, Mike Toogood and David Peerless on the broad reach to the BHYC turning mark. For the second round, a wing mark was laid just off Fisherman’s Pontoon. Although a bit of a procession, it was still necessary to concentrate and the reaching legs provided some interesting spinnaker work. By the finish, David had overtaken Robin to take third. 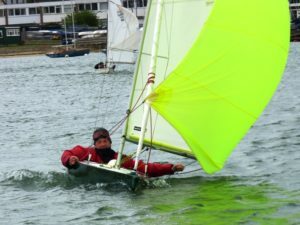 Using the same course, the start of the second race was certainly closer and it was again Bruce’s green Illusion that led the fleet around the two round course. There was not a lot separating the next three, David, Robin and Bill who enjoyed some close racing. However, as the two Mike’s (Issaias & Toogood) found to their cost, cutting the corner of Attrill’s Point and running aground was always going to end in tears! 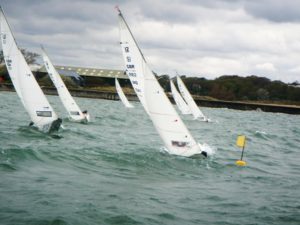 The option of poking their noses outside the harbour for the final race was too good an opportunity to miss, so although it was decided Pepe was a step too far, an additional windward mark was laid about 100 metres outside the entrance. It did not take Bruce long to establish himself in the lead as they tacked out of the harbour into the not-inconsiderable wind over tide chop. Bill was second and David was third as all eight showed just what amazing boats the Illusions are. Although they kept their places, mid-fleet there was a bit of place changing on the run to the leeward mark and then the final beat to the finish at the original windward mark. Congratulations to Bruce who can now hang the Woodford Long Distance Trophy (a half model the J Class Rainbow) on his trophy wall; Bill and David were second and third on equal points and Robin was fourth. Another good day’s racing and an excellent way to finish the 2017-2018 Illusion season. The 2018-2019 Illusion season starts in early October and we much look forward to seeing the fleet back in Bembridge again.